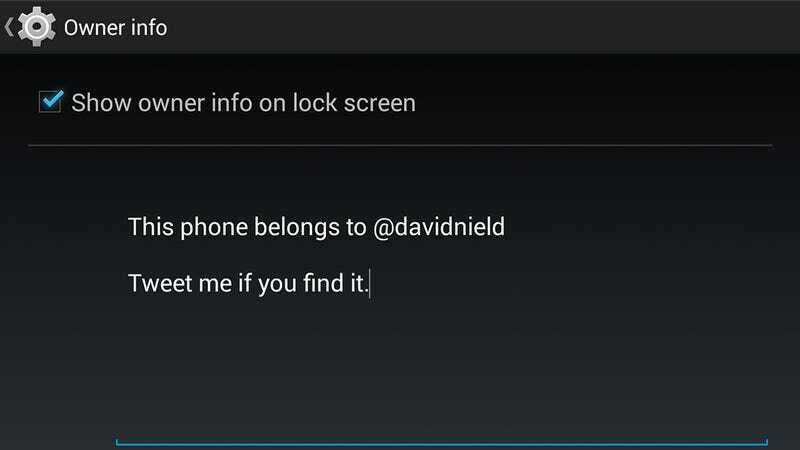 The latest versions of Android include a handy feature that you might not know about: the option to display your contact information on the lockscreen, which can be used if you misplace your phone or tablet. You can access the feature from the Settings app by tapping Security and then Owner info. Tick the box and compose your on-screen message accordingly. On Samsung's TouchWiz, you need to choose Lock screen, Lock screen widgets and then Owner information to get to the same feature. If you're rocking an HTC Sense-powered handset, then you're out of luck—the manufacturer has removed the option. The best you can do is include these details on your phone's lockscreen wallpaper, which is also an option on iOS. You can in fact choose to display anything you like on the lockscreen—an email address, a contact number, a postal address, and so on. Bear in mind that anyone who comes across your device is going to be able to read whatever you write, so you might not want to reveal where you live. A Twitter handle is a good option, as it's something already in the public domain but makes getting in touch with you over the Web straightforward. The same information screen can be used to provide next-of-kin information if you're involved in an accident. If you've incapacitated in some way, then your mobile is going to be one of the key ways for those on the scene to identify who you are. Of course, it's only going to work if your lockscreen is activated, and there are several other ways in which you can prepare for being parted from your smartphone.